More useable news. . .
Cyril Neville celebrated his birthday with a few friends in Austin, his new abode, a few days back. So, I thought I’d put up his very collectable Josie single cut, “Gossip”, with backing from his brother Art and the Meters in 1969 and wish him well. Departing from most other Josie singles associated with the Meters, this one just says that it was produced by Sansu Enterprises, rather than by Allen Toussaint and Marshall Sehorn. In the Neville Brothers' autobiography, The Brothers Neville, Cyril says that the sessions for this single took place in Macon, GA where the Meters were recording at the time, and that Marshall Sehorn, Toussaint’s business partner, ran them. He drove Cyril up from New Orleans to try to record something on him and sign him as a solo artist, as suggested by Art. 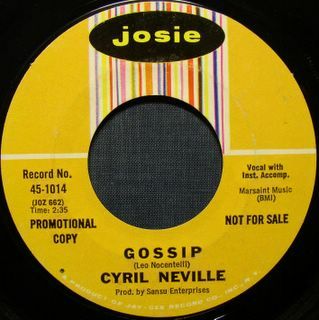 Although Cyril never signed on with Sansu, Sehorn did record him in Macon doing two of Leo Nocentelli’s songs, “Gossip” and “Tell Me What’s On Your Mind”, released as Josie single #1014 (my copy is a promo with “Gossip” on both sides). In fact, I think it is Cyril’s only solo single, as remarkable as that is. Leo’s use of an electric sitar on this track certainly dates it; but the band’s strong signature funk, augmented by a well-fit horn arrangement, makes this rare track smoke. No wonder it's still sought after 36 years down the line. Cyril’s vocal has a fire to it that can’t be ignored; and his singing on the single’s flip is soulful, too. Although Art already wanted Cyril in the band as a vocalist, even at this early date there were tensions in the Meters that kept that from happening. Over the next few years, Cyril did session work with the band as percussionist and background singer; but he did not officially join the Meters until 1975, when Fire On The Bayou, was recorded. Soon thereafter the band started to unravel and had dissolved by 1977. Of course, Cyril then went on to join his brothers, Art, Aaron, and Charles to form the Neville Brothers band that has been going for nearly 30 years now itself. On the side, he ran another funk band more slanted towards reggae and world music, The Uptown Allstars, and has released several solo CDs as well. But when the Meters re-grouped this year, Cyril was conspicuously absent. While immensely talented, this once angry young man has carried his reputation as a firebrand far into adulthood. Much of the music he creates brandishes hard to miss socio-political messages. I believe I read that his T-shirt at the big benefit concert in New York said "Ethnic Cleansing In New Orleans" or words to that effect. While his truth speaking may be admirable, it can overshadow his true songwriting gifts, especially his love songs. Considering his strong opinions and vocals, one wonders what the Meters might have been like and done had Cyril joined earlier. Their final album, New Directions, probably is the best indication of that, with Cyril singing lead on and co-writing many of the tunes. A lot of Meters purists didn’t take well to Cyril having a more up front role; but I can’t help feeling that Art was onto something. . . .
------Forgot to mention that both sides of Cyril's Josie single can be found on the Rhino Neville Brothers retrospective CD series. "Gossip" appears on the double CD set Treacherous: A Historyy Of The Neville Brothers 1955-1985; and "Tell Me What's On Your Mind" is on Treacherous Too!. Fans of New Orleans music should have those CDs close at hand. I've been trying to buy this 45, unsuccessfully, for over a year! The flipside is one of my favorite songs and this is my first time hearing "Gossip" in its entirety. Picked up a copy of Treacherous to get the song...but I picked up a vinyl copy which does NOT have this song on it! 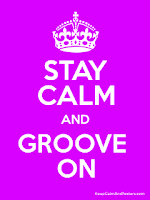 Thanks for posting this, great tune!